Now let’s unbox this coffee machine. It is a very simple coffee machine and easy to operate, no hassle at all. So the box consists of the main unit of the Nescafe Gold Blend Barista Machine, a user manual, a small milk measuring cup, a drip grid and drip tray. The coffee that is recommended for this Nescafe Gold Blend Barista Machine is Nescafe Gold Barista Style Intense, Nescafe Gold Blend and Nescafe Gold Blend Decaffeinated. Alternatively, other freeze-dried coffee options can also be used. 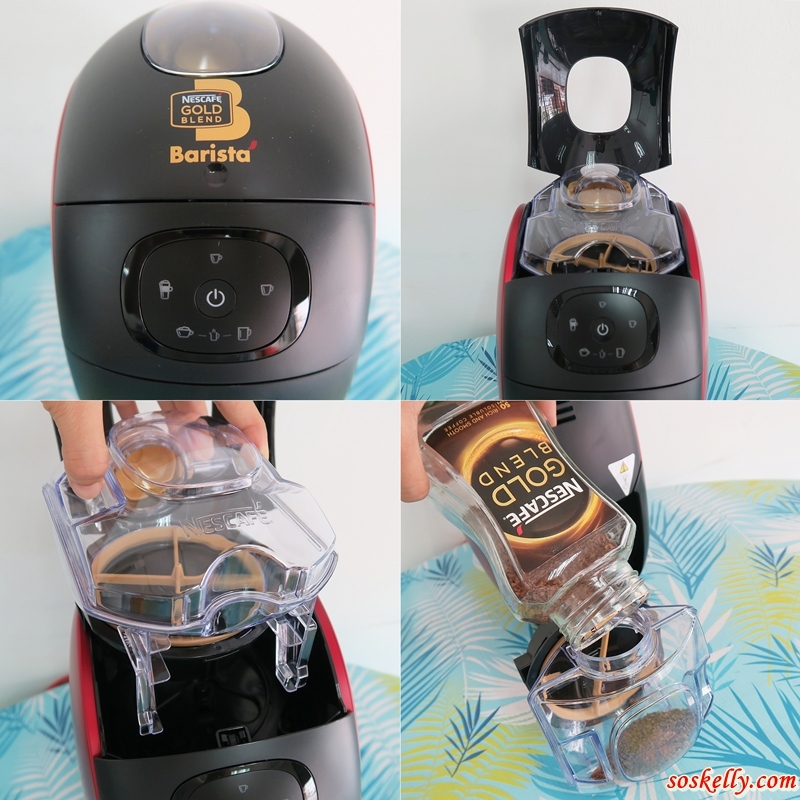 However, the fine powdered coffee is not recommended to be used in Nescafe Gold Blend Barista system because it will result blockage in the machine. So please take note on this. At home I usually drink Nescafe Gold Blend, it’s a premium blend of Arabica beans that are roasted to perfection and delivers a smooth aromatic cup of coffee. Nescafe Gold Blend Barista Machine can make variety of café style coffee such as latte, cappuccino, espresso, lungo and americano. Before having this machine, usually every morning I make a quick up of coffee using Nescafe Gold Blend and add hot water. Now with this new Nescafe Gold Blend Barista I can choose to have Americano or Lungo. In the morning I prefer my coffee black without milk and sugar as it gives a boost to me. 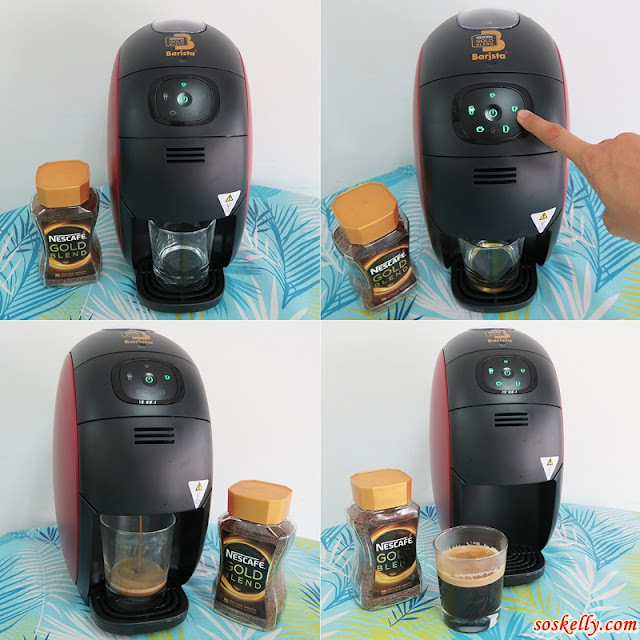 The differences when I use the Nescafe Gold Blend Barista Machine to make my coffee it has a stronger aroma, the coffee taste richer, smoother and bolder. And I can have the foam on top of my coffee, it’s taste and looks like café coffee. Initially I thought it’s my psychology only but when my friends came over to my house I make coffee for them using this machine without letting them know about it. They commented that the coffee taste better than before. 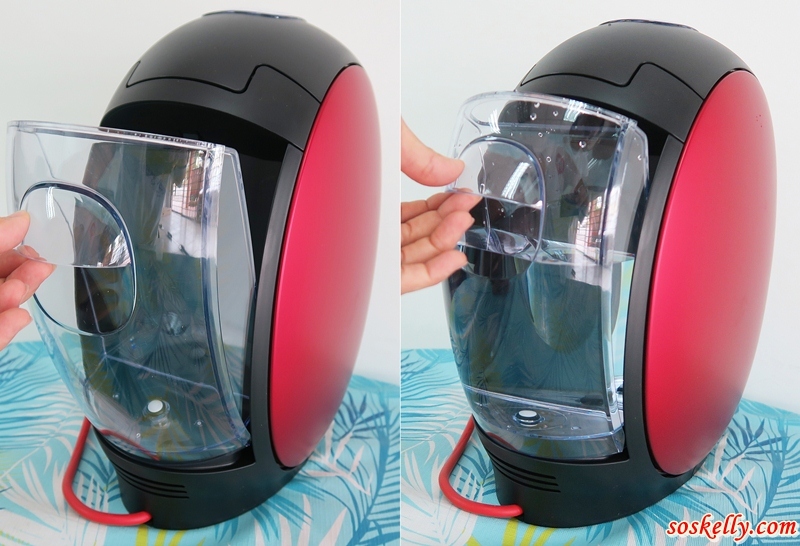 The machine is easy to operate, open the top cover and take out the coffee box. Then I filled the coffee box with my Nescafe Gold Blend. Next is filled the water in the water tank. Press the on button and then the machine is ready. For the first time user you might have to run the rinse once before using the machine. Each and every detail steps you can refer to the user manual. So choose the coffee that you wish. Here is my cup of Lungo! If you wish to have latte or cappuccino the use the milk measuring cup to pour the milk in the cup. Great easy right and now enjoy! This Nescafe Gold Blend Barista Machine is hassle free and easy to maintain barista machine that is perfect for home or soho usage. It is easy to operate and the machine is affordable too. Plus the coffee powder that is suitable for this machine is the freeze-dried coffee powder that do not need filter and I can easily purchase them in the supermarket or hypermarket. Overall, Nescafe Gold Blend Barista Machine has redefined my coffee experience. When I have this machine I prefer to chill at home and enjoy my cup of coffee alone or with my friends and family rather than hangout at the café so often. This helps me to save money in the long run as well. Thanks to Involve Asia for inviting us to this Nescafe Coffee Making workshop. Thanks to Nescafe Malaysia for generously presented us the Nescafe Gold Blend Barista Machine for review. For those who are keen to redefine your coffee experience, Nescafe Gold Blend Barista Machine is available at Lazada. They are having a promotion of RM239 for 1 unit of Nescafe Barista Machine with 1 Nescafe Gold Blend 200gm Jar and 1 Nescafe Gold Blend Refill Pack. Vending Companies: the corporate is providing them with all the correct and acceptable solutions. individuals currently don't need to hesitate. this is often as a result of the corporate offers contemporary snacks and cold drinks. If you want to read more about Vending Machine Business then please click here to continue.